An in-cabin boost control that's simple and effective. This is the second of two manual turbo boost controls covered by AutoSpeed. The first is suitable for cars that use ECU-controlled boost. That control system gives very good throttle control, with boost rising with factory-style gentleness. But if you want boost to come on as hard as possible, or your car doesn't use ECU-controlled boost, this boost control is the one for you. Over more than seven years and five different turbo cars the control has performed faultlessly. It's cheap, easy to install and costs less than A$75. Cars without ECU-controlled boost use a very simple system. A hose from close to the turbo compressor's outlet feeds boost to a wastegate diaphragm. The diaphragm is connected by a rod to the wastegate, a valve that when open allows exhaust gas to bypass the turbine. On the other side of the diaphragm is a factory-set spring. Boost pressure travels down the short connecting hose, deflecting the diaphragm against the spring. If the factory wastegate canister is set up for 7 psi boost (which is typical of many Japanese cars), the diaphragm will be deflected so that the wastegate valve will bypass enough exhaust gas to hold boost at close to 7 psi. On the turbo shown here you can clearly see the hose connecting the turbo compressor outlet to the wastegate actuator. The easiest way of getting maximum boost is to simply pull off this wastegate hose! That way, all the exhaust gas from the engine will pass through the turbine - none will be wasted. You can't get any more boost out of the turbo than that - but the peak boost pressure will almost certainly be too high. Too much boost results in detonation and broken pistons.... not what's wanted. But if you remove just a little pressure from this hose, the wastegate won't open as far, more exhaust gas will pass through the turbine - and boost will be a bit higher. Any device that reduces pressure in the wastegate hose by letting air escape from it is called a bleed. 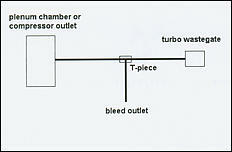 However, it is very important to note that not all wastegate bleed systems work in the same way! This point is often overlooked. 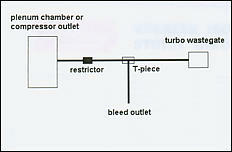 This diagram shows a typical wastegate bleed. A T-piece is inserted in the wastegate hose and air is bled out. One of the problems with taking this approach is that often a lot of air needs to be bled from the line before the wastegate actually sees a lower pressure. That's because there is an awful lot of air available from the turbo - bleeding off just a bit often makes little difference to the pressure seen by the wastegate actuator. The way to overcome this problem is to insert a restriction before the bleed, as has been done here. This way, the bleed needs to flow only a small amount of air to make a large difference to the pressure seen by the wastegate diaphragm. Introducing the restriction is fundamental to the way in which this system works. The insertion of the restrictor also adds a measure of wastegate delay - the wastegate doesn't start to open until all the hosing the other side of the restriction is filled with pressurised air. That's the theory - what about the practice? You'll need two valves, one or two T-pieces, some quarter inch hose and some hose clamps. The main in-cabin (or under-bonnet) control valve is a quarter inch needle valve, which is the valve on the left in the picture. 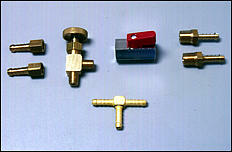 A needle valve is a multi-turn (often 5 or 8 turns) brass valve that gives fine control over flow. It's like a well-made tap. For the restriction, it's best to use a quarter inch ball valve (on right). A ball valve also allows adjustment of the flow through it, but it's a valve that either shuts off the flow or fully opens it with just a 90 degree turn. Both of those valves are available from companies than specialise in pneumatics and hydraulics - check your phone book. While you are at the valve supplier, pick up a quarter inch T-piece and some hose clamps. The only other part needed is a couple of metres of quarter inch fuel hose - you can easily work out exactly how much you need before you go to buy it. The system is organised as shown in the diagram. The location of the ball valve restriction, T-piece and needle valve are important - don't get their positions within the system confused. 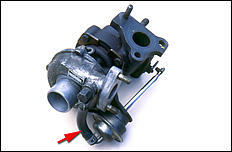 The ball valve (the restriction) is normally placed under the bonnet close to the turbo. 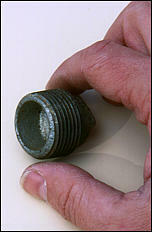 The needle valve (the adjuster) can also be under the bonnet or if you wish, you can mount it inside the cabin. With the system connected, fully open the ball valve and fully shut the in-cabin needle valve. Drive the car and check the peak boost. It should be standard. Next, fully open the needle valve. Again drive the car - in most cars, boost should be standard or up only a little. However, be careful - boost might be raised at this point. With the needle valve fully open, close down the ball valve by a very small amount. Boost should now be lifted a little. Keep closing it down and test-driving until boost reaches your new maximum. With the needle valve fully open, the boost level should reach the new maximum. With it closed, boost should fall to standard. An "in between" setting of the needle valve should give an "in between" boost level. Put a dob of epoxy glue on the ball valve handle so that it can't be inadvertently knocked open or closed. We fitted this boost control to a Nissan EXA. Before the system could be installed, the EXA's safety pressure relief valve on the plenum chamber was removed and a normal hardware store water pipe plug screwed in to replace it. 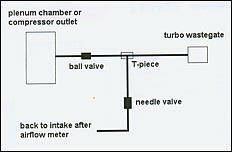 The ball valve restriction was then mounted on the inner guard close to the turbo and the needle valve was placed at a convenient location on the dash. A comparison of the new and old boost curves is shown here. Note that the new boost curve falls in level as revs climb. This characteristic of the boost control system causes concern to some, but it has a major benefit. The control system has a built-in "over-boost" capability that allows the engine to pull a higher peak boost pressure for a short time. Most cars can tolerate a peak boost level higher in the mid-range than can be sustained at high revs. If desired, adjustment of the two valves can be used to dial out much of this drop-off, which also varies from car to car. If you want an even higher initial peak boost value, simply T into the wastegate line a small sealed volume, such as a small aerosol can or the pictured camping water container. 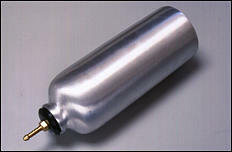 This will allow boost to flare a bit, as the can needs to fill with pressurised air before the wastegate starts to move. This can be a surprisingly effective modification - on one Charade Turbo, fitting just the over-boost can was enough to give wheelspin on every full throttle first-second gear change!